This is a modern style sea kayak that mounts Yamaha's PAS electro-hybrid bicycle technology. It can be used for leisurely picnics while paddling on the water or for wild long distance touring propelled by the pedal-driven propeller. The build-in outrigger appendages can be extended to give excellent stability for care-free family use. Its light weight makes car-top carryable and no boat license is necessary. All in all the "Sea PAS" is an environment-friendly, people-friendly craft for shoreline water fun. 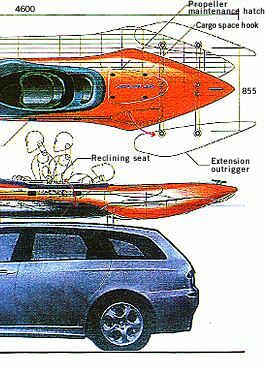 The concept vehicle "Sea PAS"
The "Sea PAS" is a craft that almost anyone can enjoy with ease and convenience on shoreline waters. First of all, you don't need a boat license for it. Since we attached outrigger appendages to the highly stable new hull design, almost anyone from children to the elderly can use it. (The outriggers can be extended or retracted while out on the water.) Because it is light, two people can load it on a cartop carrier to take it anywhere. 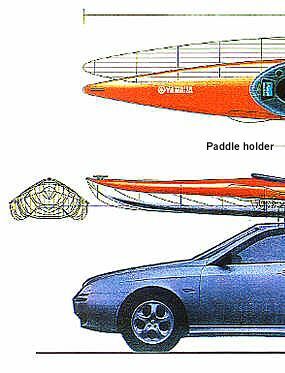 The canoe/kayak style format was chosen for its increasing popularity in places like North America and Europe amount the sports-minded, health-minded and environmentally concerned people. But, paddling alone can be tiring, so we added a lightweight, easy-to-pedal PAS unit and a propeller. You can use the "Sea PAS" casually with just a paddle or add the pedal-driven propeller power to cruise at faster speeds with ease. Switching on the PAS power assist function makes it possible for anyone to enjoy long-distance touring. By making selective use of these three power sources, it is also possible to imagine all kinds of adventure-type uses. Thanks to the tunnel-type hull design, the propeller hardly extends below the hull line at all, which makes it usable in even shallow waters without fear of damaging the water environment. This is another reason why the "Sea PAS" is a minimum impact vehicle for shoreline water fun that is environment-friendly and people-friendly.